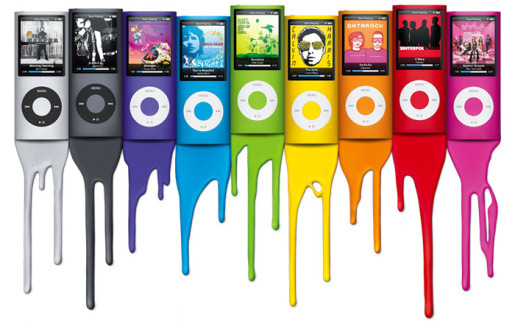 Apple has just launched the new 4th-generation iPod nano ad. Steve Jobs presented the thinnest iPod ever at the “Let’s Rock” event, held at San Francisco’s Yerba Buena Center for the Performing Arts. 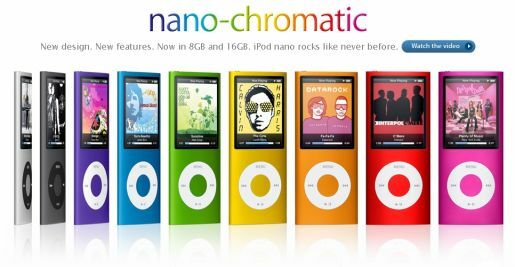 The new iPod is featured in “Nano-Chromatic”, a TV ad featuring “Bruises” by Brooklyn group Chairlift, from their album, Does You Inspire You?. Apple’s new iPod is designed with a curved aluminum and glass enclosure, in nine vibrant colors. Genius technology gives users the option of automatically creating playlists from songs in their music library that go great together, with just one click. The iPods feature a refined user interface, a high resolution portrait display and a built-in accelerometer which automatically switches to Cover Flow when rotated and automatically goes into Shuffle mode when lightly shaken. The Paint commercial was developed at TBWA\Media Arts Lab by chief creative officer Lee Clow, executive creative directors Duncan Milner and Eric Grunbaum, creative director/art director Scott Tratner, art director Demian Oliveira, copywriter Alicia Dotter, agency producers Mike Refuerzo and Hank Zakroff. Animation was produced at Logan by Flame artist Brandon Sanders with VFX by Mork & Lys. Music is Bruises by Chairlift. Chairlift members Caroline Polachek (vocals), Patrick Wimberly (drums), Aaron Pfenning (guitar) formed their group in Boulder, Colorado, but moved to New York City in 2006.